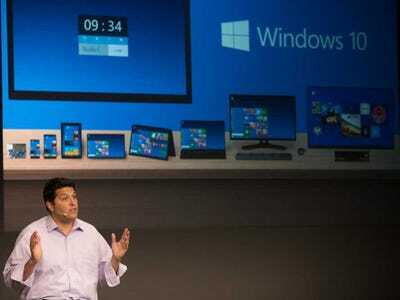 Microsoft’s next version of Windows will be chock full of things to attract its biggest customers, enterprises. Microsoft will allow IT professionals to buy applications in bulk from an app store, something Apple has offered for years. But in Microsoft’s case, the IT departments will also be able to assign these apps to individual people through a username/password technology that many IT departments already use: Active Directory. In particular, IT departments can use a cloud version of Active Directory, hosted on Microsoft’s cloud Azure, to assign specific apps to specific people. People will then be able to “click on the link to install the apps” to whatever device they use, according to a blog post from Microsoft’s Jim Alkove. If a company already has a private app store that it is hosting itself, Microsoft promises that the new Windows 10 portal will allow be able to work with it. Managing thousands of apps on thousands of mobile devices has become a major pain for IT departments. After companies complained for years about how hard this was to do with Apple iOS devices, Apple significantly upped its enterprise app management features in 2013 with iOS 7. As we previously reported, businesses want more custom apps for their mobile devices, and they want the app stores to help them manage these apps, too. Apple is looking to its partnership with IBM to help with that. By the time Windows 10 ships, the Apple/IBM partnership will at least a year old. Clearly Microsoft has no intention of being left behind.